First, My place of residence is 1323 N. Campbell Ave.
Third, I was born on the 24 day of November anno Domini, 1867, at Warmezo, Hungary. Fourth, I emigrated to the United States from Bremen, Germany, on or about the 25 day of February anno Domini 1913, and arrived in the United States, at the port of Baltimore, Maryland, on the 21 day of March anno Domini 1913, on the vessel Rhein. Fifth, I declared my intention to become a citizen of the United States on the 28 day of December, anno Domini 1915 at Chicago, Illinois, in the Superior Court of Cook County, Illinois. Sixth, I am married. My wife’s name is Helen; She was born on the 5 day of April, anno Domini 1881 at Szilagy Megye Hungary, and now resides at 1323 N. Campbell Ave, Chicago, Ill. Seventh. I am not a disbeliever in or opposed to organized government or a member or affiliated with any organization or body of persons teaching disbelief in or opposed to organized government. I am not a polygamist nor a believer in the practice of polygamy. I am attached to the principles of the Constitution of the United States, and it is my intention to become a citizen of the United States and to renounce absolutely and forever all allegiance and fidelity to any foreign prince, potentate, state, or sovereignty, and particularly to Hungary or any independent State within Former Austria-Hungary Empire, of whom at this time I am a subject, and it is my intention to reside permanently in the United States. Ninth. I have resided continuously in the United States of America for the term of five years at least, immediately preceding the date of this petition,to wit, since the 21 day of March, anno Domini 1913, and in the State of Illinois continuously next preceding the date of this petition, since the 27 day of March , anno Domini 1913, being a residence within the state of at least one year next preceding the date of this petition. Declaration of Intention No 50297 and Certificate of Arrival No. Blank from Department of Labor filed this 2 day of March, 1920. Each being severally, duly, and respectively sworn, deposes and says that he is a citizen of the United States of America; that he has personally know Salomon Deutsch the petitioner above mentioned, to have resided in the United States continuously immediately preceding the date of filing his petition since the 1st day of Feby, anno Domini 1915, and in the State in which the above entitled petition is made continuously since the 1st day of Feby, anno Domini 1915, and that he has personal knowledge that the said petitioner is a person of good moral character, attached to the principles of the Constitution of the United States, and that the petitioner is in every way qualified, in his opinion, to be admitted a citizen of the United States. Subscribed and sworn to before me by the above-named petitioner and witnesses in the office of the Clerk of said Court at Chicago, Ill., this ___ day of ___, anno Domini ___. By Signature (illegible) Deputy Clerk. 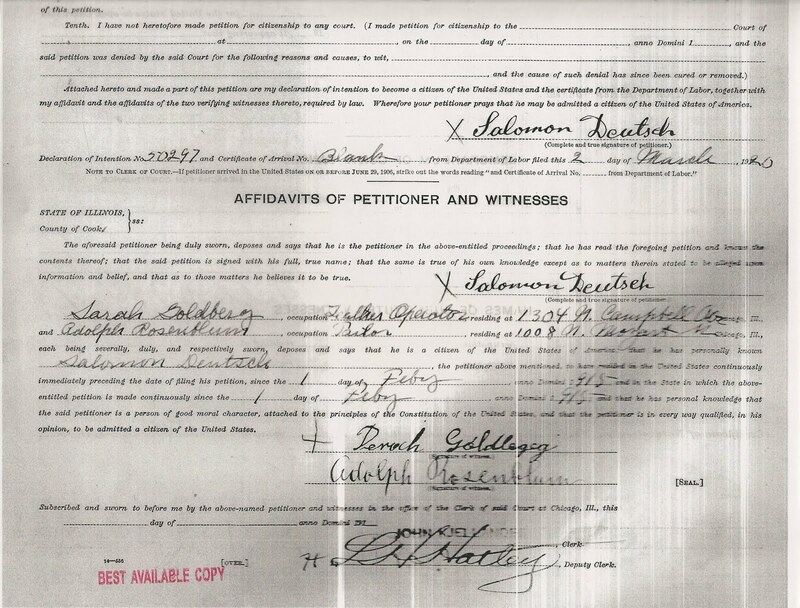 1) What I noticed on the petition of my great grandfather, Barney Newmark, was the list of names of his children. The document didn't specify the children that were living in the US. Barney's children were all living in the US. However, my great grandfather, Salomon Deutsch, had a daughter from a first wife who remained in Hungary. She was mentioned in the audio recording my grandfather and his siblings created in the 1970s, however, they didn't remember her name. Now I have a name - Rose - a date of birth - and a location in Hungary. At first glance this is the initial crumbling of a brick wall. However, there are some problems. 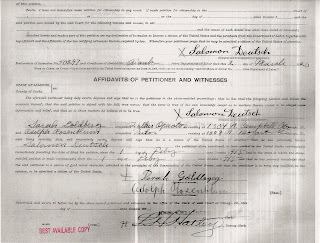 2) The date of birth for Salomon doesn't match up with his military documents. 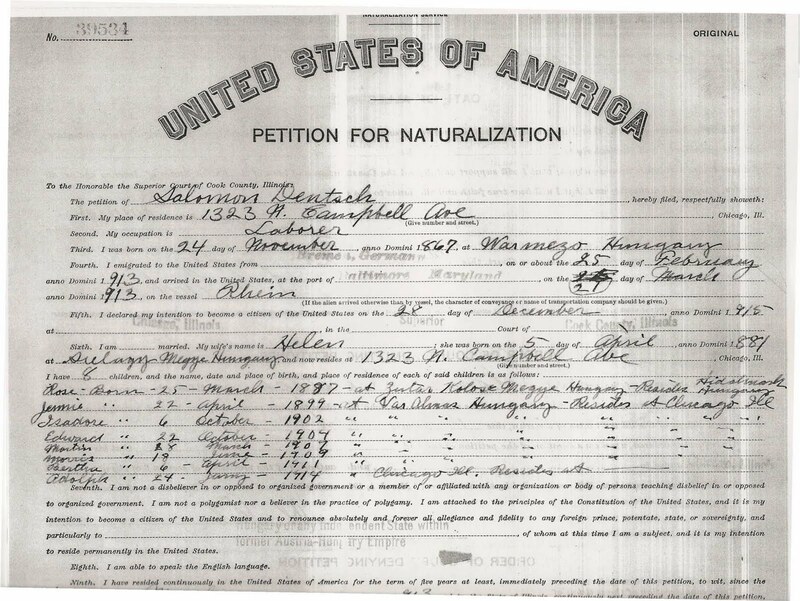 The petition says he was born in 1867. His military document say he was born in 1861. Since he began his service in the army of Franz Josef in 1881, I believe the 1861 date is likely correct. He may have fibbed by a year or two to serve early, but no 14 year old is going to be able to pass for 20. However, I am not surprised he would make himself six years younger to make it appear more likely to immigration officials that he was young enough to find a job. The Deutsch family came close to being deported as it was due to his inability to find work. mistake was made in writing it down, and Rose was really born in 1887. However, my grandfather and his siblings in the 1970s recalled she had married and had six children. It's possible she kept in touch after they left Hungary, but it's also possible she may have already married and had those six children before they left. identifies the wrong day of the month for each of them. 5) Allen is listed as Adolph. This actually matches his birth certificate. 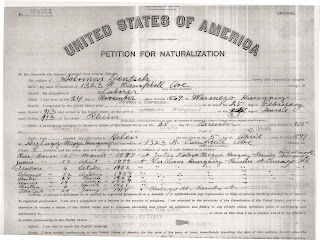 He is listed in the census as Abraham in 1920, and as Albert in 1930, but it's clear now that the birth certificate wasn't a clerical error, and Adolph may have originally been his given name, even though they called him something else from early on. 6) The names given for all the children are their "American" names. For some of them, like my grandfather, this wasn't very different from their Hungarian names. My grandfather's Hungarian name was Marton. However, for others, the name did vary. Salomon's daughter "Jennie" was "Jenka" in Hungarian. (And she later went by the name, Jean.) I'm unsure how Isadore morphed to Ted, or Theodore. "Rose" doesn't sound like a Hungarian name, and I suspect any Hungarian documents I might find for her wouldn't say, "Rose." Furthermore, on his military documents, my great grandfather is listed as Salomon Deuts, so the surname went through some changes as well. So while I have a name, and date of birth for his first daughter, it's not clear either would match any Hungarian documents, so I'm not much closer to finding out what happened to her and her children.